For the rolls: In the bowl of an electric mixer, combine warm water, yeast, sugar, salt, egg, yolk, milk, butter and 1 1/2 cups of flour. Process on low speed for a couple of minutes or until everything looks completely combined. Change to kneading mode, add the remaining flour (reserve 1/4 cup) and knead for 7 minutes or until the dough comes apart easily from the sides of the bowl. Lightly grease a clean bowl. Transfer the dough to this bowl, cover with a clean kitchen towel and let rise in a warm place until it doubles in size, 2 hours approximately. When the dough has had time to rise, hit it with a closed fist to deflate it, knead it for a few minutes inside the bowl and then transfer to a floured surface. Stretch the dough into the shape of a rectangle. For the filling: Brush the flour with the melted butter. Cover with the light brown sugar and cinnamon. Add the slices of pears over the cinnamon and sugar. Roll the dough as you would do to make a jelly roll and cut into 3/4 of an inch rounds. Place them inside the greased mold. Cover with a clean towel and let rise again until the rolls double in size. Preheat oven to a 350° F. Bake for 35 minutes or until lightly golden. Remove from oven and place on cooling rack to cool. Remove them from the mold while they’re still warm to keep them from sticking to the bottom. For the icing: Combine sugar and milk until you have a smooth mixture and pour over the cinnamon rolls. Serve immediately. For a variation of this recipe, use apples or blueberries instead of pears. You can also make the icing with heavy cream or yogurt, instead of milk. I’ve already told you that I love to bake bread, right? 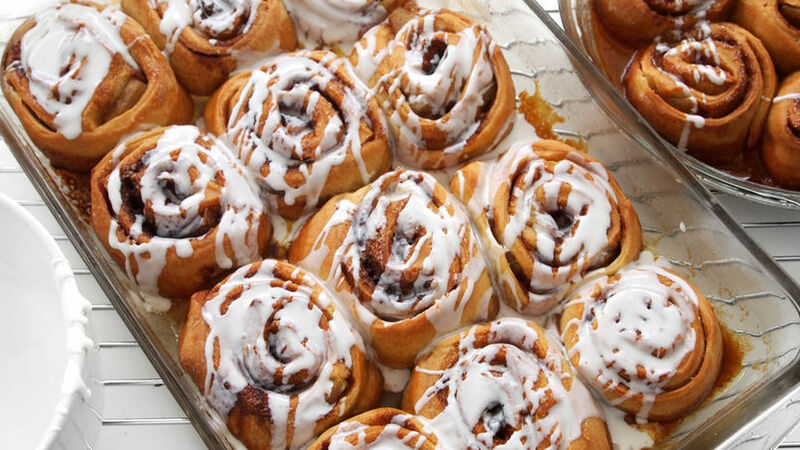 These cinnamon rolls have always been on my list of culinary sins… It’s just that they are so delicious and versatile that I never tire of them. For a while, I used to make them with a pecan filling, but in this recipe I’ve added pieces of pears, a fruit that’s very characteristic of autumn and that it’s perfect for making breads and other wonderful desserts. If you have fresh pears on hand, peeled them and cook them in a little water with sugar until they are tender. If not, canned pears are fine. Give them a try!